Johnny is a true fan of darth Vador. Darth Vador, alias Anakin Skywalker, is the very bad guy of one of the most famous hexalogy ever: Star Wars. Being fan of a vilain is so special that I could not avoid taking a picture of johnny representing Anakin Skywalker. The fact is that when you listen to Johnny taking about Darth Vador, you start thinking differently. You almost undertsand the man and how and why he dived into the dark side of the force. 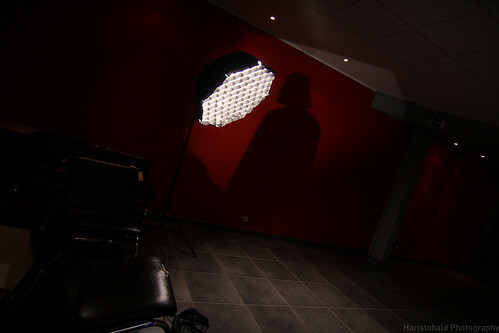 Finding a way to take the portrait of Darth Vador without the use of a costume wasn't an easy job for the mind. I also wanted to associate Johnny with the Sith Lord as he use to do himself. For this shooting I needed a more powerfull Speedlight Projector. I had to make another one to fit one alienbee AB 800. 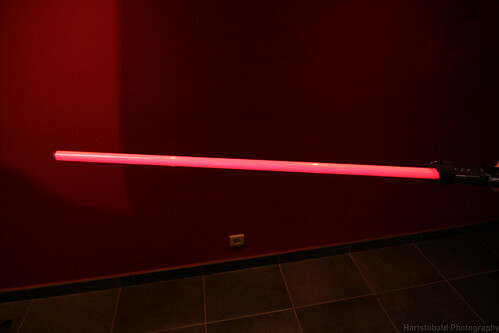 I wanted to use a non-speedlight-lighted light saber therefore the ambiant light had to be precisely setuped. Once the camera settings chosen, I had to setup the SP and the in-the-octobox AB800. 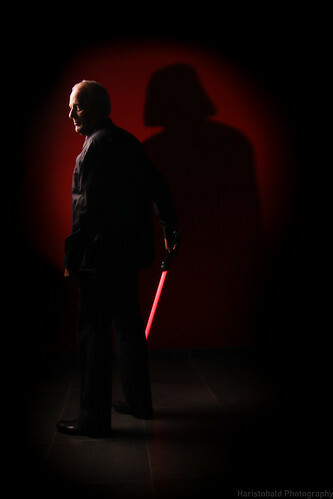 To show the dark side of johnny, I decided to project darth Vador's shadow behind him. But to match the picture perfectly, the shadow had to come from Johnny's direction. So I made a slide with DV's shadow and another one with dark gradient circle to avoid lighting the sharp sides of the SP. That was the easy part! The difficulty here was to make Johnny fit into the shadow and to rimlight him without lighting the red backwall. Ludovic was kind enough to play the perfect assistant while we where waiting for johnny and perfecting the setup. The grid on the octobox helped me to control the spill. An interesting thing I only noticed in post was the light lighting of the sabre on the backwall. It kind of diffuse the lower part of the shadow. That small light gives a subtle effect that gives a even more strange feeling to the picture.